Symphonic. Among the 1,000 books I’ve read in the past five years, Richard Powers’ novel, Orfeo, ranks among the top five. Powers builds layer after layer of meaning as he draws readers into the life of protagonist Peter Els, a retired composer with an interest in chemistry. In the same way that a symphony uses multiple instruments and motifs to build toward a single, integrated work, this novel weaves out a narrative of the present and the past, leading a reader to a very complete work of art. What is discord, harmony, life, meaning? What is the power of music? Powers takes the myth of Orpheus and brings it to life for contemporary readers using great skill and offering us hours of engaged and interesting reading. If you love music, or life’s big questions, chances are you’ll love this novel as much as I did. Rating: Five-star (I love it) Click here to purchase Orfeo from amazon.com. Playful. After I began to read the third short story in the collection of ten by Ricka Galchen titled, American Innovations, a growing impression hit me hard: this woman loves to write. Once I gave myself over to her quirky charms, I delighted in these stories, and found them witty, surprising, unconventional and fun. Readers who enjoy literary fiction, especially short stories, are those most likely to enjoy the finely written stories in this collection. Rating: Four-star (I like it) Click here to purchase American Innovations from amazon.com. Distance. The most unusual memoir or autobiography I’ve read in a while is Paul Auster’s Report from the Interior. Much of the book is written in the second person, highlighting the distance that time has created between the author at his current age and his reflections on his early life. These finely written reflections triggered comparable memories from my own early life. I also enjoyed reading the letters that Auster wrote in his late teens and early twenties. Readers who like fine writing will find the prose in this book very enjoyable. Rating: Four-star (I like it) Click here to purchase Report from the Interior from amazon.com. Ordinary. Most of what I’ve read about Iran has come from periodicals and focused on troubled politics of one form or another. Thanks to reading Hooman Majd’s book, The Ministry of Guidance Invites You to Not Stay, I have more impressions about ordinary life in that country. Following many years living in New York, journalist Majd decided to bring his Wisconsin-born wife and newborn son to live for a while in the country of his birth. What I enjoyed most about this book was the everyday joy with which they engaged with others, and the skill with which Majd writes about their experiences. Readers interested in learning more about Iran are those most likely to enjoy this book. Rating: Four-star (I like it) Click here to purchase The Ministry of Guidance from amazon.com. Light. Readers who enjoy finely written prose are those most likely to enjoy reading Michael Cunningham’s novel, The Snow Queen. Set in hip Brooklyn, the novel presents the contemporary life of a closely knit non-traditional family. Protagonist Barrett Meeks shares an apartment with his brother Tyler who lives there with his lover, Beth. Barrett and Beth work together in the vintage shop of another character Liz, whose current paramour is more than twenty years her junior. There’s a yearning among all these characters for coolness and meaning, yet their behavior remains more adolescent than adult. After being dumped by another boyfriend, Barrett pauses in the park to look up and observes a light than both captures his attention and disturbs him. Is this the light that erases the feelings of darkness? Beth’s cancer draws all the characters away from themselves and toward understanding. Rating: Four-star (I like it) Click here to purchase The Snow Queen from amazon.com. Different. I loved reading Akhil Sharma’s novel, Family Life. With great skill, Sharma removes all embellishment from his novel about an immigrant family and their encounter with tragedy in their new country. No words are wasted in his presentation of their story. After just over 200 pages, Sharma has said everything that is important about being different and being a family. Readers who love fiction that brings us into unfamiliar lives to find human nature exposed in all its reality and those most likely to enjoy reading this finely written novel. Rating: Five-star (I love it) Click here to purchase Family Life from amazon.com. Glasgow. Fans of crime fiction are those most likely to enjoy reading Denise Mina’s novel, The Red Road. This is the first novel I’ve read by Mina, and I thoroughly enjoyed her characters and plot. Protagonist DI Alex Morrow comes across as a perfectly complete human: caught between work and home; highly skilled and also stumbling; confident and uncertain. Past and present time frames add to the complexity of the story, and brought me added pleasure. The case is interesting, the characters intriguing. Rating: Four-star (I like it) Click here to purchase The Red Road from amazon.com. Operatic. Readers who enjoy historical fiction as well as fans of Renaissance art are those most likely to appreciate the setting of John L’Heureux’s novel, The Medici Boy. The narrator is Luca Mattei, an assistant to Donatello. L’Heureux creates all the elements of fine opera in his novel: a story of love with consequences; betrayal; and occasional comic relief. Florence comes alive in what readers expect of historical fiction: known figures mixed with fictional characters in a speculative narrative. I entered the story quickly as my interest was engaged in the first dozen pages, and I read the novel in a few entertaining sittings. Rating: Four-star (I like it) Click here to purchase The Medici Boy from amazon.com. Anhedonia. Colson Whitehead may be one of those individuals among us unable to experience pleasure (he describes himself as a citizen of the Republic of Anhedonia), but he sure knows how to deliver pleasure through his writing. I’ve enjoyed his novels, and found his new non-fiction hilarious. 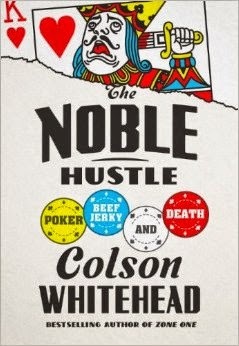 In The Noble Hustle: Poker, Beef Jerky, and Death, he relates his experience competing in The World Series of Poker. I laughed at the many characters and their antics, and found Whitehead’s self-deprecating comments the funniest of all. 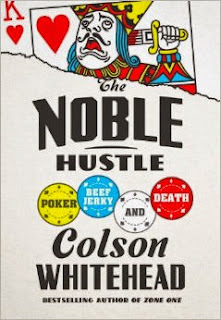 The popularity of poker should draw even more fans to Whitehead’s great writing. Rating: Four-star (I like it) Click here to purchase The Noble Hustle from amazon.com. Retired. Some of the fictional detectives I like most seemed frozen in time, while others age along with the rest of us. The 24th Inspector Wexford novel by Ruth Rendell titled, No Man’s Nightingale, presents this character very well settled into his retirement. His current project is reading The Decline and Fall of the Roman Empire. What gets him out of his reading chair is the murder of a female vicar who is biracial and a single mother. Social issues of the present trump the story of the past, so Reg Wexford leaps at the request of Detective Superintendent Burden to join him on the case. Rendell does her usual fine job of laying out lots of suspects and letting Wexford be himself. Readers who like this series and detective crime fiction in general are those most likely to enjoy this novel. Rating: Four-star (I like it) Click here to purchase No Man’s Nightingale from amazon.com. Artists. I find that at some times I prefer novels that reinforce for me a familiarity with human nature, and at other times I like novels that introduce to me aspects of human behavior with which I am more unfamiliar. I assign Jessica Lott’s debut novel, The Rest of Us, to that latter category. The lives and behavior of the central characters of this novel involve dimensions of academia and art that are unfamiliar to me. I found myself entranced by this love story supplemented by the passion of being artists. I didn’t like the characters, and didn’t identify with them, but thanks to Lott’s fine prose, I kept wanting to see where all this would lead, and how their lives would change. Readers willing to try a literary debut novel should consider reading this one. Rating: Four-star (I like it) Click here to purchase The Rest of Us from amazon.com. Book. I seemed to have finished reading Donna Leon’s novel, By Its Cover, just minutes after starting it. Leon reprises Commissario Guido Brunetti and draws him into a case involving the theft of rare books. The extended cast of characters includes many familiar ones from this series, supplemented by new and interesting villains and citizens. As always, Venice itself remains as vivid and present as a character, and food is always important. This time another interesting distinction arises: is it the physical book that is important, or the text contained therein? Brunetti’s view differs from that of other characters. Fans of the series, those who love Venice, and readers who like character-based crime fiction are those most likely to enjoy this novel. Rating: Four-star (I like it) Click here to purchase By Its Cover from amazon.com. Manipulation. If it were not for having strong desires, none of us could be manipulated. Once those desires and longings are revealed, we are vulnerable to being manipulated. Harlan Coben weaves multiple plotlines together in an exciting crime thriller titled, Missing You. Social media, particularly a dating website, plays a prominent role in this novel. Protagonist NYPD detective Kat Donovan has a deep longing to convict the person who killed her father. When she sees a photo of her lost love on a website her longings for him return. Those two desires blend together as Kat kinds herself involved in a case outside her jurisdiction. Coben keeps readers on alert from beginning to end, as he unfolds an exciting story of vulnerability and desire. Rating: Four-star (I like it) Click here to purchase Missing You from amazon.com. Kindness. How can we possible repay the kindness of strangers? Do our memories define our identity? David Stuart MacLean’s memoir, The Answer to the Riddle Is Me, goes a long way to explore those questions. The life-altering event that MacLean shares with readers involves what happened following his adverse reaction to an anti-malarial drug called Lariam. Following a blackout in a Hyderabad train station, he awakens with no recollection of who or what he is. Thanks to a kindly train station agent and a police officer, he finds protection and care. He presents his search to figure out who he is with well-written prose and great insight into the formation of identity. Any reader interested in the mind, drug reactions or the ways in which we rely on others to become ourselves will find a lot to enjoy in this book. Rating: Four-star (I like it) Click here to purchase The Answer to the Riddle Is Me from amazon.com. Orders. Readers who like character-driven action novels will find a lot of satisfaction from reading David Baldacci’s The Target. Protagonists Will Robie and Jessica Reel are reprised along with other characters from previous novels, so longtime fans will feel comfortable with familiar people. One theme in the novel involves whether to follow orders or not, a dicey matter to consider in the chain of command world of Robie and Reel. Baldacci takes some of the action to North Korea in this novel and the situation there will drive chills up the spines of most readers. Rating: Four-star (I like it) Click here to purchase The Target from amazon.com. Extended. For those readers who like to boil down fiction into a few plot categories, the novel by Julia Glass titled, And the Dark Sacred Night, has a journey plot. Protagonist Kit Noonan searches for his father, and on this journey discovers an extended family. Glass draws all these characters with great skill. I enjoyed the transformation of Kit from an unemployed art history professor whose life seemed directionless, to a fully functioning adult with strong ties to his extended family. For readers who like a good story line and well-developed characters, this novel is worth your time. I loved this exchange close to the end: ‘“It’s a perfectly connected world.’ ‘Well,’ Kit laughed, ‘imperfectly connected.’ ‘As we all are,’ said Bruno, ‘man, as we all are.’” Rating: Four-star (I like it) Click here to purchase And the Dark Sacred Night from amazon.com. Skills. The more pages I turned while reading Peter Heller’s novel, The Painter, the more I appreciated the author’s skill. Every time I came to an understanding about protagonist Jim Stegner, Heller would add a layer of complexity. All the characters in the novel reside in that gray area where most of us live as neither wholly good nor wholly bad. Generally good people do very bad things and generally bad people do very good things. Heller twisted and turned my expectations about behavior as his lyrical prose mesmerized me with descriptions of western outdoor life. Stegner’s skills as an artist and as a killer seemed almost effortless. The depths of his love and loss influenced both his art and his violence. I highly recommend this novel to readers who enjoy literary fiction and who can tolerate depictions of violence. Rating: Five-star (I love it) Click here to purchase The Painter from amazon.com. Wrong. If you can finish reading Matt Taibbi’s The Divide: American Injustice in the Age of the Wealth Gap, and not feel a sense of moral outrage, you have no heart. From the time we were toddlers, most of us developed the value that we should strive for fairness in our dealings with others. When faced with injustice, we seek redress. Taibbi presents our current predicament: we have institutionalized injustice in the different ways in which we treat the rich and the poor. The divide that Taibbi explores includes many dimensions, the most significant of which for me involved the crimes we prosecute and the crimes that we consider “too big to jail.” The stories of how some people have been treated shocked me, and opened for question my view that the rights of citizens are respected in our society and that the innocent have nothing to fear. Rating: Five-star (I love it) Click here to purchase The Divide from amazon.com. Marriage. What keeps a marriage together? Jenny Offill approaches an answer to that question in her novel, Dept. of Speculation. She wastes few words in this book: every sentence seems distilled to richness. We don’t live in narrative flow, and what flow there is in this book involves snippets of a little piece of this and that, which is precisely how we live. Our marriages become the sum of all the little things. Are we prepared for when a big thing comes along? How will we stay together after infidelity? What is fulfillment? When I sat down to read this novel, the quirky snippets seemed to be leading nowhere. Before long, I realized that Offill was piecing together a portrait of modern lives that captures marriage in all its joy and struggle. Rating: Four-star (I like it) Click here to purchase Dept of Speculation from amazon.com. Differences. There’s a real show-off quality to the writing virtuosity that Sam Thompson displays in Communion Town. If when you visit art galleries, you’re the one who spends long periods of time in front of a single work of art to appreciate all you possibly can, the ten stories in this book are perfect for you. Don’t read it as I did, in two sittings. Instead, read one story a week slowly and carefully to appreciate the differences from one to another. I read this too quickly, and often didn’t appreciate how all the varying perspectives and writing styles were both individually well-crafted and contributed to an integrated whole. Rating: Three-star (It’s ok) Click here to purchase Communion Town from amazon.com. Mind. There are many great reasons to read Penelope Lively’s memoir, Dancing Fish and Ammonites. Her prose soars. Reading the recollections of others can stimulate one’s own recollections. We’re all aging, and the observations of a fine writer can inform readers about aspects of that process. The workings of the mind are fascinating, and when presented by Lively seem to deepen. A few sentences on objects can trigger one’s own observations about prized possessions and their meaning. Any time spent with such lucid intelligence may lead to some of it rubbing on the reader. Pick your reason and then read this book before your life slips away. Rating: Four-star (I like it) Click here to purchase Dancing Fish from amazon.com. Con. Frankie Abandonato, the protagonist of James Magnuson’s novel, Famous Writers I Have Known, is a con artist. After fleeing New Jersey in haste after he conned a mobster, he finds himself being met at the Austin, Texas airport by three creative writing students who think he is the reclusive writer they are intended to meet and transport to teach in their renowned program. Magnuson’s satire will appeal in a special way to anyone familiar with university writing programs. General readers are likely to enjoy the con, the charm of many of the characters, and the pacing of the story. Rating: Three-star (It’s ok) Click here to purchase Famous Writers I Have Known from amazon.com. Dublin. Fans of noir crime fiction are those most likely to enjoy reading Gene Kerrigan’s Dark Times in the City. While I’ve visited the city in the title, Dublin, as a tourist, Kerrigan brought me inside the landscape of the criminal element that I never noticed in this place. The art of war is explored here, as characters are manipulated. Protagonist Danny Callaghan comes alive as a fully formed interesting and complex character, thanks to Kerrigan’s fine writing. We’ve all found ourselves, like Danny, in the wrong place at the wrong time. Read this novel and find out what Danny has gotten himself into and what he has to do to get out of his predicament. Rating: Four-star (I like it) Click here to purchase Dark Times in the City from amazon.com. Selfish. Have you ever taken a wrong turn while driving and decided to keep going to see where the road leads? I certainly have, with mixed results. After a dozen or so pages into reading Jane Green’s novel, Tempting Fate, I realized my wrong turn. I confused this author with Jane Casey, whose crime fiction I’ve enjoyed. Instead, I stumbled onto this popular novel often classified as chick-lit. Instead of accepting my error and tossing the book aside, I kept reading, curious about a genre that I don’t pursue intentionally. What I found was an unappealing protagonist, Gabby, whose selfishness causes her life to turn upside down. She risks her twenty year marriage and faces consequences. Now that I’ve taken this road once, I know a little more than I did before about this genre. I may not travel this road often, but I found it more engaging than I expected. Rating: Three-star (It’s ok) Click here to purchase Tempting Fate from amazon.com. Understanding. Readers looking for a charming novel that helps you feel good about humanity should consider reading Matthew Quick’s The Good Luck of Right Now. This may be the most unusual novel I’ve read in a long time. Protagonist Bartholomew Neil grieves the death of his mother, with whom he has lived for all thirty-eight years of his life. Structured as a series of letters that Bartholomew writes to Richard Gere, we follow the cast of troubled characters on a journey toward understanding and a future that leads them to rely and depend on each other. Rating: Four-star (I like it) Click here to purchase The Good Luck of Right Now from amazon.com.